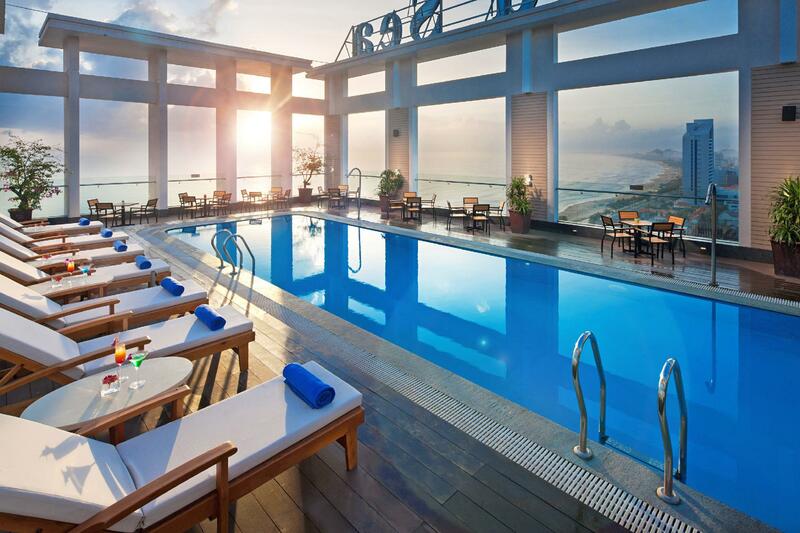 Have a question for Diamond Sea Hotel? "The hotel was next to the beach and the staffs were great!" "The staffs are good, hotel is good too!" 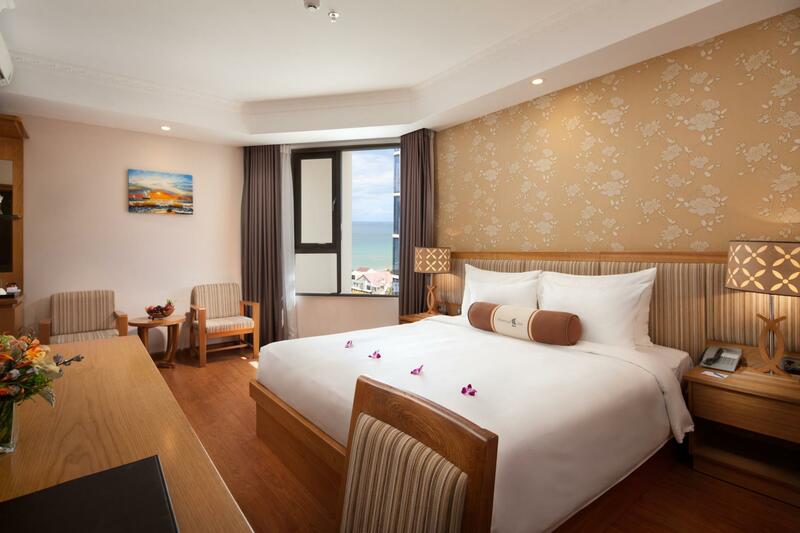 "Relately near to city centre with free shutter and as well a..."
Situated in Phuoc My, Diamond Sea Hotel is the perfect place to experience Da Nang and its surroundings. Only 3.5 km from the city center, the hotel's strategic location ensures that guests can quickly and easily reach many local points of interest. With its convenient location, the hotel offers easy access to the city's must-see destinations. The facilities and services provided by Diamond Sea Hotel ensure a pleasant stay for guests. 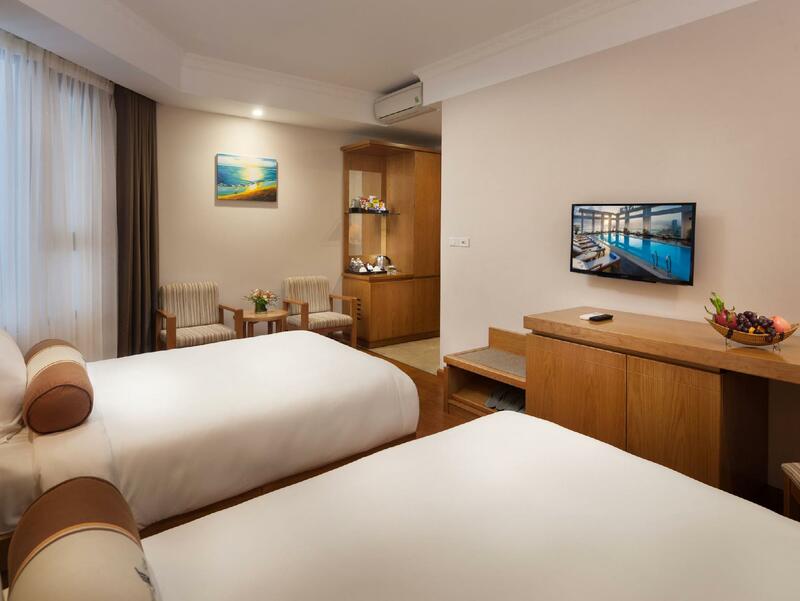 Free Wi-Fi in all rooms, 24-hour security, daily housekeeping, fireplace, taxi service are just a few of the facilities that set Diamond Sea Hotel apart from other hotels in the city. 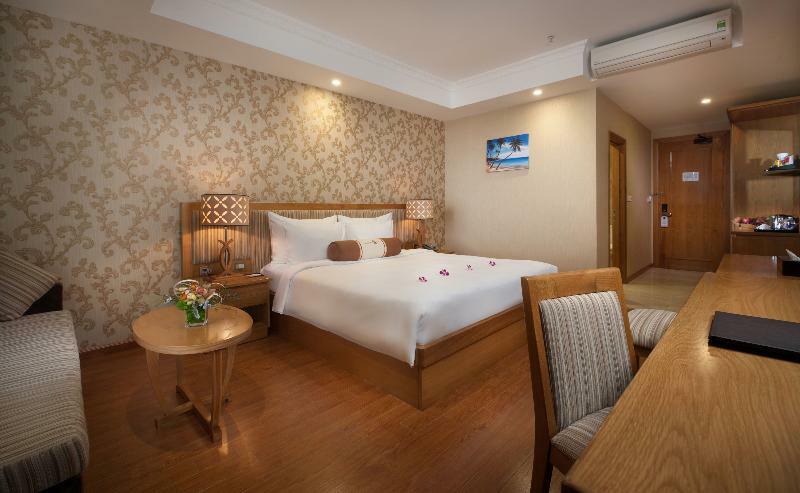 The ambiance of Diamond Sea Hotel is reflected in every guestroom. 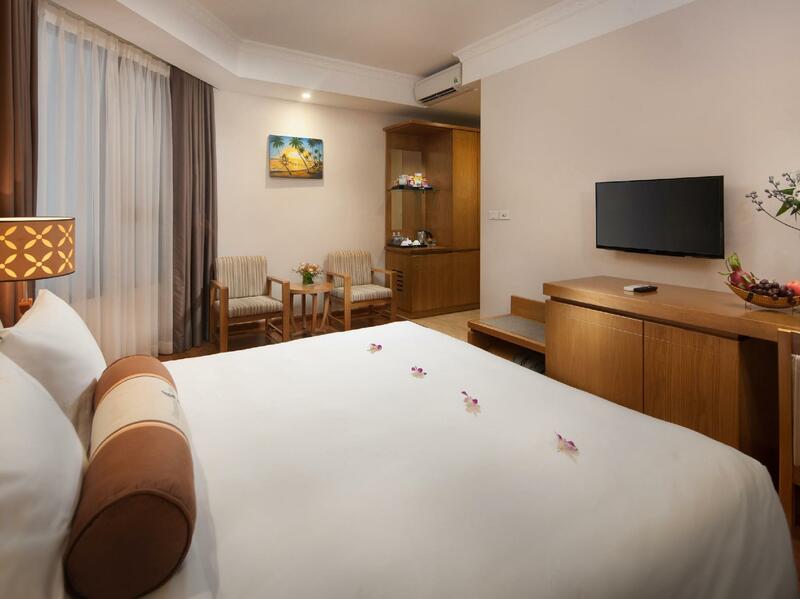 television LCD/plasma screen, internet access – wireless (complimentary), non smoking rooms, air conditioning, heating are just some of the facilities that can be found throughout the property. The hotel's fitness center, sauna, outdoor pool, spa, massage are ideal places to relax and unwind after a busy day. 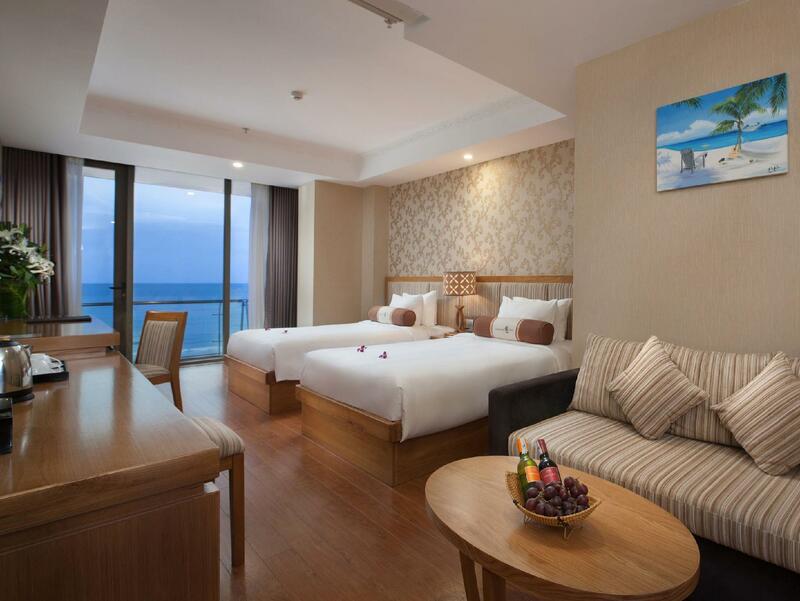 When you are looking for comfortable and convenient accommodations in Da Nang, make Diamond Sea Hotel your home away from home. 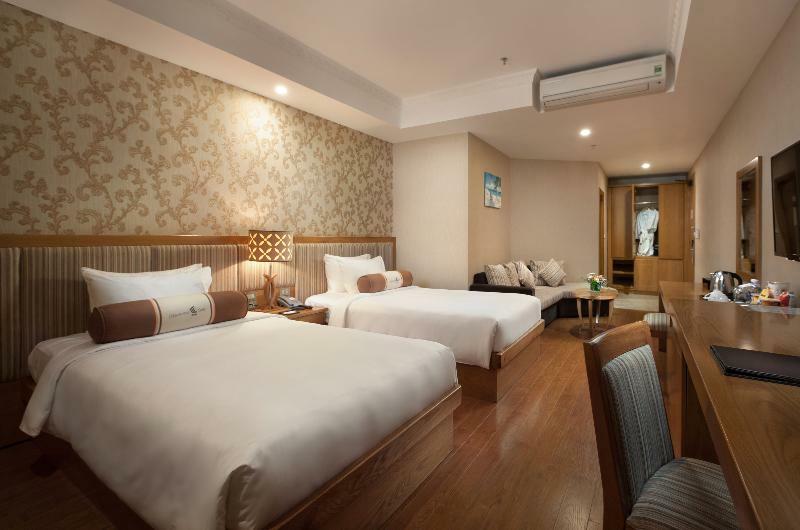 "A wonderful hotel in good location, very near to My Khe beac..."
The property offers complimentary shuttle bus from Da Nang International Airport to Hotel with fixed schedule. Reservation is subject to shuttle bus availability and advance booking is mandatory. Guests who wish to utilize the service are kindly requested to inform the property flight details and expected arrival time at least 48 hours prior to check-in date. 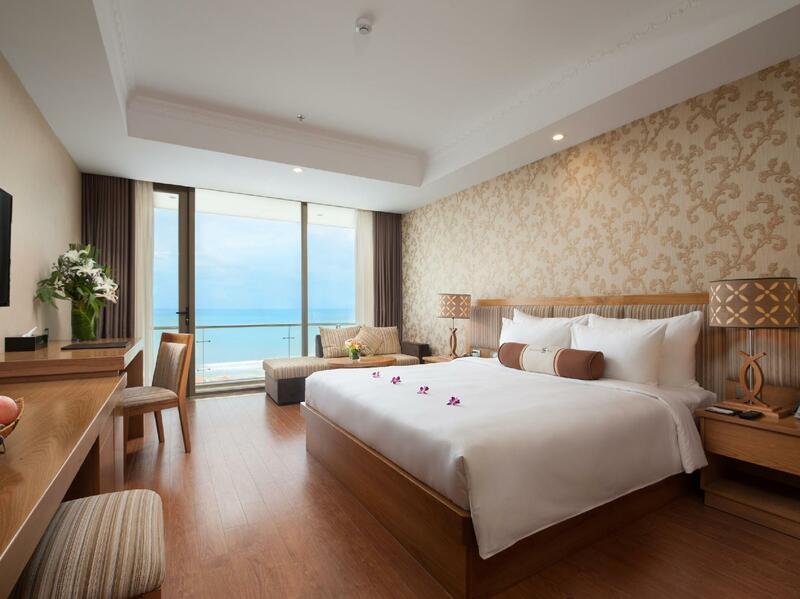 Dear valued guest, Diamond Sea Hotel is located in the rapidly developing city of Danang, we would like to make you aware that in the near vicinity of the property construction work is conducted which may influence your stay – during this period the hotel maintains an adjusted room rate as displayed. We booked two room for two couples. The ocean view room was amazing however the standard room has a window with a wall outside so the view is a wall. The hotel - the in room dinning and mini bar prices are very reasonable so you don't have to worry about eating outside (except for the water). The ocean view room is worth the extra bucks. The staff is very helpful and friendly and service is excellent. I would go back to this hotel and highly recommend it as you just need to cross the road to get to the beach. A wonderful hotel in good location, very near to My Khe beach and many seafood restaurants. The hotel's staffs were friendly and helpful. The breakfast were so good. The room were clean and quiet, I love hot water system in the hotel, it is so convenient for my babies. Love it! Pros: Personal touch Great staff that attends to all your needs Food Location Amenities Cons: Don't see one yet in my 4 days of stay. Good location and walking distance to beach. There is so much hotel building going on in Da Nang that a visitor is spoiled for choice. Diamond Sea is an upper-midrange price but offers very good value for money. This was my second stay there & I would be happy to make a third..
Amazing experience, out of my expectation. Since this is my girlfriend birthday trip, hotel can help me to prepare some surprise for her. Also, the location is wonderful, you just need to cross the road to the beach. The view of our room is also amazing, it is relaxing to have this view. Of course, staff are nice and helpful. I booked a sea view room. The view was amazing. You can see the sunrise from the balcony. Room was clean with all the things you needed. While we were stayed during the mid autumn festival, hotel gave us moon cake as a gift. Very good experience in this hotel. Highly recommended! Nice pool,kind staff, excellent location, reasonable price. At firts, the room smells like mold but next day after cleaning it was okay. (airing out is needed?) Also, the pool looks great but in the morning I saw some insects on the water. I'm happy with breakfast especially rice noodle soup. Nice hotel very close to the beach and a bunch of local restaurants behind. We had a nice, clean and spacious room that was comfortable for our stay. A decent enough breakfast with a good selection of food. Other faculties at the hotel such as the gym and rooftop swimming pool was good. First time to danang, i want to rent a motorcycle, but hotel's staff want i to rent it with the security guard. The security guard wants me and his friend to rent a motorcycle & want keep my passport. But the security guard's friend seems to be rogue, how can i safely give the most important passport to him. And after that day, i have not seen them. He and i said that the motorcycle is very expensive, but it is cheap motorcycle. I have a lot like this motorcycle at my home town, lied to me. Thinking that I don’t know what price. Good breakfast, good environment and nice roof top pool. Everything here is perfect. Staff are very friendly and professional. Wifi in the room is not very stable. We stayed for 3 nights in Seaview room at 17th Fl. All staff were very nice and always smile. It's kinda rare in Vietnam to be honest. We totally satisfied and we recommend this hotel. However, you may see local guests who has no mannar at all. It's not the hotel side issue. This was my first time in Danang. Just took a shot in the dark when booking this hotel. I wasn't sure about the location and nor was I sure about the hotel. So... I just booked it for 3 nights and gave myself an opportunity to leave sooner then later if I had to. From the moment I arrived to the moment I entered my room, I was thoroughly impressed. I was so impressed that I extended my stay 2 additional times. YES...2x. You will not find a better location. That I promise! You will not find the most caring, kind, helpful, smiling staff anywhere!!!! The staff from the guys that park your rented motorcycle to the people that clean your rooms and all the other teams in the middle have surpassed all expectations I ever had of customer service. The pool was perfect... absoloutley perfect! The gym had dumbbells that allowed me to create my own WODS. The buffet had a great selection and I always indulged...soooooo goooood! Don' think twice, just book it!!!!! Front desk staff speak good english and very helpful. Room daily cleaning just ok, but overall environment is good. Some mini storea and local restaurants nearby, and very close to the beach. Hotel car rental not good, recommended to use grab. The beach was just opposite the hotel, crossing the main road. Beach was crowded with local and tourists, the sand were soft and clean, very comfortable to walk barefooted. Dragon bridge around 10mins by taxi or grab, night walk was cooling but didn’t wait for the dragon “fire performance “. Lady Buddha is also nearby by taxi/grab. Many hotels next to each other, so you still have a choice. Overall hotel staff, cleanliness is ok, buffet breakfast was fine. Didnt use the facilities or pool as spending most of the time outside. 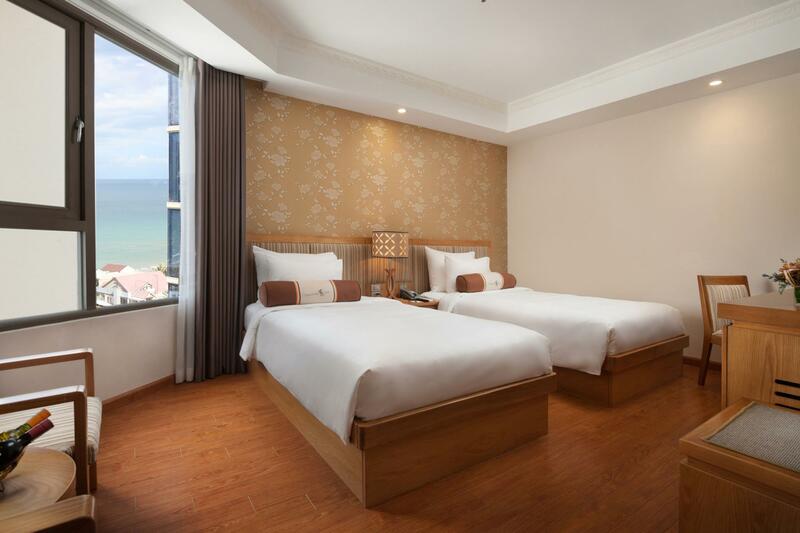 Spacious and clean room with seaview balcony. Some noise from the road. Rooftop pool was nice but quite small as usual. Great breakfast buffet and delicious food on the restaurant. Lot of taxis in the front, also private car/driver available. Excellent service & staff. This must be the best hotel in the area.